Dubai, UAE, June 6, 2018: ba&sh's Spring-Summer collection is an invitation to joy and spontaneity, with a touch of humour and boldness. 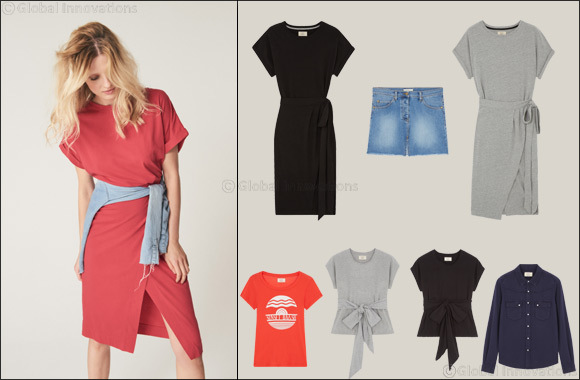 An easygoing mindset rhythms the outfits all through the season with this new collection which expresses coolness and good vibes. Spring announces itself as an explosion of bright colors and of freshly blooming flowers. Transported to a pleasant summer garden, the chlorophyll and mint tints of green, the poppy reds, the pink monochromes, the lemon yellows, the lavender and royal blues will animate our femininity and get us all smiling! We will also discover pastel shades bringing softness and peacefulness while the assembling of navy, red and off white defines the sporty chic allure which is very present throughout the collection. All the creations in these lines are rich in animated and contrasted textures. The diversity of fabrics, mattes or shiny, blurred or vibrant fuels our desire to slip into them! Prints are very present and mostly draw their inspiration from the heart of Asia. Japanese cherry blossoms and other traditional Chinese patterns are here reinterpreted in delicate silks and crimping materials like viscose and polyester. Prints designed for the height of summer have mainly been elaborated on ravishing cottons or light cotton nettings suggesting more ethnic patterns and Indian cashmeres. The codes of the Parisian sporty chic style have been made with an American influence, subtly allied to British guipures, lace and embroideries. An American football spirit is flirting with Victorian romanticism, and we love it! No detail has been left to chance, eyelets dress up and sprinkle dresses and blouses. Frills, glitter and lurex make the wardrobe pop and bring us a Glam Rock touch. Three personalities have been chosen to be our muses this season: Jacqueline Bisset, cinema icon, incarns to perfection elegance and natural class. The French-American actress Camille Rowe with a half Parisian, half Californian appearance inspires through her cool, fresh, bohemian and feminine style. The Gypsy rock and glamour style of American top model Grace Hartzel, who has a wild and luminous face, imposes itself through her young style and brings us a different viewpoint on the collection. The ba&sh SS18 collection is available in stores now.